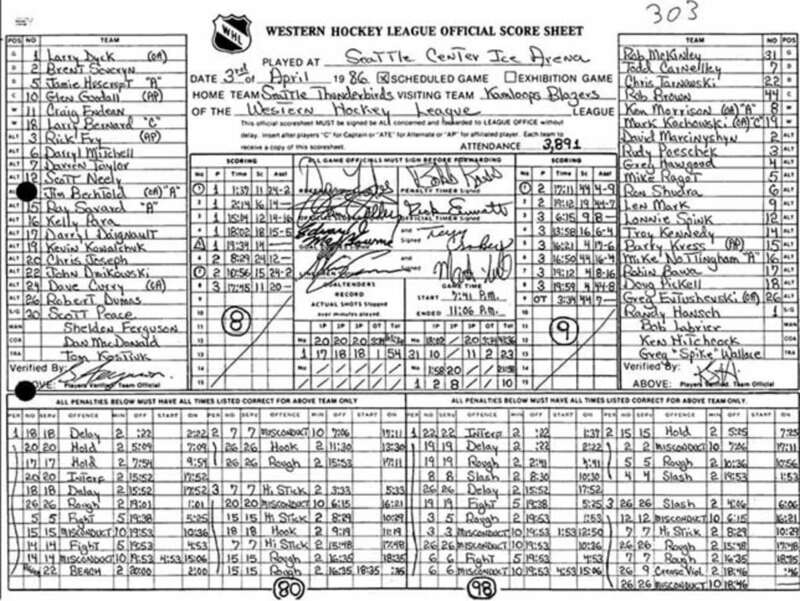 Thirty years ago, Ken Hitchcock coached a Western League team that would have driven the NHL version of Ken Hitchcock bonkers. And 30 years ago yesterday, Hitchcock coached in one of the craziest games ever. both teams in the NHL score in a game these days. The Blazers scorched their opponents on a regular basis that season, but were in a world of hurt that night in Seattle. The Thunderbirds, inspired by a home crowd of almost 4,000, got out to a quick 1-0 lead on a goal by Craig Endean just 1:37 into the game and were ahead 2-0 before the three-minute mark. Then they really started piling on. The Thunderbirds were ahead 5-0 after the first period and by the time Ray Savard scored at 10:56 of the second, the Thunderbirds were flying with a 7-0 lead and looking to get back into the series on home ice. And this is where things start getting crazy. Rob Brown, who would later go on to become a 100-point man in the NHL, scored what seemed to be a meaningless goal with 2:39 left in the second. The Blazers closed the gap to 7-2 before the period ended, but Seattle was still well in control of the game. That was, until the second intermission. In one of those only-in-junior hockey things, the Thunderbirds held a promotion after the second period where they drove an old beater out to center ice and fans were invited to throw paper airplanes at it. The first one to land a paper airplane into the driver’s seat won a prize. When the promotion was finished, arena staff started up the car to drive it off the ice, only to have the engine explode and the car catch fire. “There was a big, black stain on the ice that they had to get rid of,” Hitchcock said. “And it took them about 20 minutes to do it. I think what happened was they lost all their energy. We were just going to play it out.” The Blazers didn’t even score their third goal of the game until the 6:15 mark of the third, but then began showing why they were the class of the league. They scored three more after that to narrow the gap to 7-6, only to have to have Endean score into an empty net to make the score 8-6 and seemingly put it out of reach. But wait.